Should We Still Call Bigfoot Paranormal? And Just What Is Paranormal? Those of us who work with paranormal subjects every day take for granted that we know exactly what that means. But what exactly is paranormal? For many people, if you ask them directly, they’ll tell you it has to do with ghosts and other anomalous entities. But we often use it to generalize the subjects of ghosts, cryptozoology, and UFO’s studies. So are we misusing the term? And should sasquatches as we’ve come to understand them still be considered a paranormal subject? The word "paranormal" means "outside or beyond normal," which seems simple enough until you realize how subjective the word normal really is. If you can’t define what normal is, how do you define what is paranormal? So, once again, we resort to the old dictionary. And according to our old, dependable Merriam-Webster, paranormal means anything "very strange and not able to be explained by what scientists know about nature and the world." And by this definition, I could surmise something normal can be explained by science, whereas something paranormal cannot. So if science hasn’t discovered it and can’t explain a subject scientifically, it’s paranormal. Simple, right? Well…not so fast. If this is true, then how does this affect subjects in science like black holes and dark matter that scientists are still only theorizing about but haven’t yet been able to fully explain? And here’s the answer Wikipedia provided: Paranormal phenomena are distinct from certain hypothetical entities, such as dark matter and dark energy, only insofar as paranormal phenomena are inconsistent with the world as already understood through empirical observation coupled with scientific methodology." I take this to mean that if scientists have decided they understand it a certain way, whether correct or not, it’s NOT considered paranormal by the standard definition. 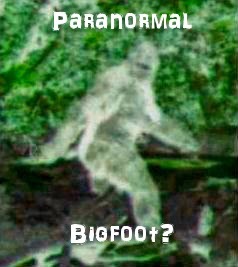 So, is bigfoot really paranormal? I’m thinking the answer is yes…and no. Sasquatches aren’t quite proven to exist beyond a shadow of a doubt but are still subject to study by a few scientists. They have been said to have been empirically observed with scientific methodology on many occasions. But they have still not been found, dissected, and classified. So they aren’t understood on the level that is consistent to what we already understand about similar forms of wildlife. So I will say sasquatches, at this moment in time, may still be dangling on the more paranormal side of the spectrum, though that’s not entirely fair. It’s not because they are ghosts, or mythical or magical. Ghosts don’t leave footprints with friction ridges, or blood, or hair, or other DNA behind for us to find like sasquatches have fairly often. But because the scientific community hasn’t given the subject of bigfoot its full attention. It hasn’t done the extensive research and made any final hypothetical assessments that echo across the board for the skeptics and believers both to embrace. And even when scientists do talk about it, the subject still gets lumped in with crop circles and UFO’s. With all due respect to all the scientists who already bravely tackle this subject every day, we commend you. It’s not easy hanging out here. But all the subject needs now to move beyond paranormal is a little more serious acknowledgement. And do I hear a resounding "Ho hum!" of frustration among believers? We’re so close to making them normal. So very close. With all the bigfoot buzz permeating the culture right now, so many witness accounts, so much physical evidence found, you’d think Bigfoot would be considered "normal" by now, even though they’re normal to us. But, (sigh) not quite. So, as many of us think the subject can and should be taken more seriously and brought out into the daylight, all I can say is, "We need just a few more scientists in here, please." Just What Is The Slender Man? Unknown Object Filmed on 6/1/2014!